President John F. Kennedy once said, "As we express our gratitude, we must never forget that the highest appreciation is not to utter words, but to live by them." 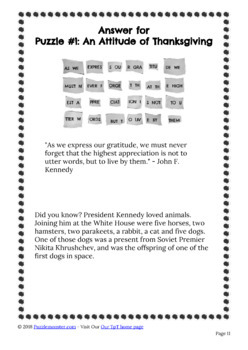 The words in this quote have been scrambled, and your students will be challenged to solve the puzzle by arranging the words into the correct order, reconstructing the quote. A fun fact is included with the answer, so it's an easy way to augment a lesson. Plus, it's not all turkeyed-up so you can use it year round! Looking for a team-building Thanksgiving activity that fills an entire period? 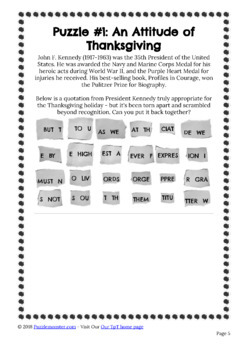 This puzzle is included as part of our Thanksgiving Break Out Box, which contains 3 other puzzles and lets students create their own Thanksgiving turkey prize! 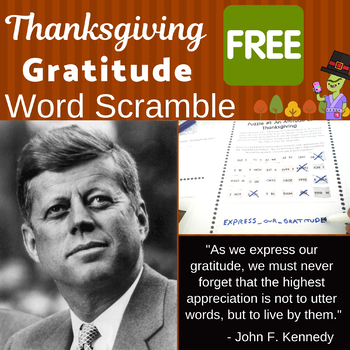 And if you like this type of puzzle, we have entire packs of non-holiday word scrambled quotes from historical figures in our Quotation Detective collections.